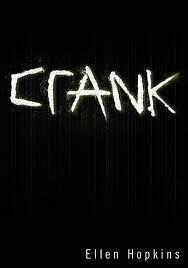 Crank is everything I heard it would be and more. It's honest, powerful and packs an emotional punch. To say I was engrossed would be an understatement - instead it was a story that demanded my attention and held it like a vice until the last page. It was incredibly sad to watch Kristina's descent into addiction. Even days after finishing the novel I found myself thinking of her. Did trying drugs that first day seal her fate or were there opportunities for her to get help? The whole story scared me to the core - the hold the 'monster' had over every aspect of her life, how easy it was for her to get hold of drugs, and how much they affected her. Ellen Hopkins really does have a way with words. Every poem or 'chapter' is beautifully crafted - either through the choice of words or by the sheer, brutal honesty they convey. Even the way the words were presented on the page seemed to add to their impact. Knowing that this book is based on the author's own experiences with her daughters addiction makes it even more powerful. It certainly does not glorify drugs in any way and hopefully will make readers think before opening that door. If Kristina's story teaches anything it makes it clear it may not be a door you can close - even if you want to.